While many homeowners are quick to fix things as they break, practicing regular home maintenance can help prevent things from breaking - and help save you time and money later. Practice these 10 tips for home maintenance on a regular basis to help keep your home in good working order. Located usually to the side of your furnace is a filter that helps catch dust, germs and debris, stopping it from circulating around your house. When these filters get clogged and dirty, they not only stop filtering the air, they make it harder for your furnace to do its job. Pull out the current filter and bring it with you to the home center the first time you replace it. This will enable you to get the correct type for your furnace and make sure it fits properly. Take the time to replace them at least quarterly, or as recommended by your furnace's manufacturer. If you have central air conditioning, your air conditioner's condenser could be the home to a lot of leaves, dirt and other debris. This can stop it from condensing properly, leaving too much moisture in the air, which in turn leaves your home feeling too warm. Take the time to open up the condenser or remove the outer cover and remove any debris inside on a seasonal basis. This will keep the air conditioner running smoothly. The duct that runs from the back of your clothes dryer to the vent that leaves your home can become clogged with lint over time. The slightly damp lint can cling to the interior of the duct, building up until it isn't able to leave efficiently. This can become a fire hazard if the lint build-up gets hot enough. Once a year, disconnect the exhaust duct from the vent and vacuum out the interior. Take a look at the duct while you're working on it; replace it if it's become cracked, rusted or otherwise compromised. All around your windows and exterior doors in your home is a layer of flexible material called caulk. Caulk is important for filling joints and cracks; it moves slightly to prevent stress on the house and it helps prevent "air leaks" and heat transfer. 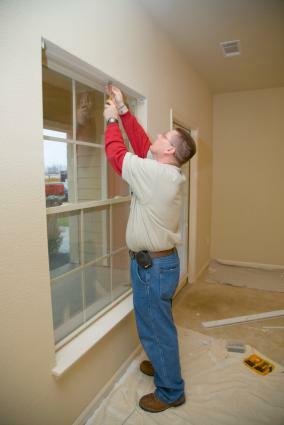 Once a year, take a walk around the interior and exterior of your home and inspect the caulk and weather stripping. Dig out any that is cracked or missing with a utility knife. Clean the area well with isopropyl alcohol, then run a fresh bead of silicone caulk in its place to seal up your home. Your gutters serve an important function on your home's exterior. They help collect water and drain it away from areas where it could build up and do damage, such as your roof. Unfortunately, they also often collect leaves, dirt, moss and other debris that make them ineffective. At least once a year, take the time to inspect and clean out your gutters to help keep the water flowing the way it should. If you live in an area with a lot of trees, you may also want to look into gutter guards to help keep the leaves out altogether. Your water heater is in almost constant use, maintaining your water at a temperature adequate to wash clothes and dishes and to bathe. Unfortunately, sediment from your water can collect in the bottom of the heater, which can cause your heater to stop working years before it should. Once a year, turn off the thermostat and connect a hose to the valve on the side of your water heater and drain it completely. Refill the tank with the hose still attached to flush sediment from the bottom, then disconnect the hose and fill it back up. While most newer smoke detectors are hard-wired into your home's electrical system, they still have a back-up battery to ensure they function in the event of a power outage. At least twice a year, take the time to replace the batteries and test your smoke detectors. Push the button on the detector long enough to illicit a long beep. If your detector doesn't beep, replace it with a new one. A GFCI, or ground fault circuit interrupter, is designed to cut the power in the event of a surge, such as what would be experienced if water were to come in contact with the outlet. All GFCIs have a test button. Once a month, place a voltage tester in the outlet and hit the test button. Make sure the voltage tester reads that the power was cut. If not, call an electrician. If you live in an area where the temperatures get below freezing, locate any water pipes that run along outside walls and wrap them with insulating tape. This will help save money, as your water won't be cooling off as it travels, and prevent the pipes from freezing. At the bottom of your dishwasher, you'll find a filter that helps strain debris as it cleans. If it becomes too clogged, small pieces of debris could harm the motor. Check your dishwasher's manual for instructions on removing and cleaning the filter, and for how often this is recommended. If you find the filter has holes in it when you take it out, replace it with a new one to protect the motor. Maintenance takes a lot less time and money to keep up with than repairs. Take some time each month to take care of one or two home maintenance steps to help keep your home in great shape.